The Horses of Honor public art campaign that began in Chicago on September, 11 of 2014 is heading to Omaha, Nebraska. Similar to the Chicago program the public art display will pay tribute to Omaha Police officers who have died in the line of duty. The year-long display of life-size police horse statues will begin on May 20, 2016, the one year anniversary of the line of duty death of Kerrie Orozco. Channel 6 WOWT-NBC in Omaha covered the recent press conference with Omaha Police Chief Todd Schmaderer and Mayor Jean Stothert. For the complete story, click HERE. “CHICAGO (CBS) — Police departments across the country are under intense scrutiny after a series of violent confrontations between officers and citizens. “But today, a 100 pound symbol of respect for the dangerous work of law enforcement arrived at the Chicago Police Department’s 19th district in Wrigleyville. Motorcyclists look over one of the Horses of Honor at the Gold Star Families Park & Memorial near Soldier Field after the 10th Ride to Remember memorial motorcycle ride Sunday. Wednesday’s ceremony also featured the unveiling of a public art installation featuring dozens of life-size, fiberglass statues of Chicago’s police horses, all sponsored by local businesses. They will be displayed at different locations downtown from Sept. 11 to November, Bauer said. The horse statues, standing 6 feet tall, reflect the mounted police unit’s tradition of naming all its horses after fallen officers. The statues, designed by local and internationally renowned artists, include a plaque recognizing the horse’s name, sponsor and artist. For graduate Michael Burke, 39, it’s a tradition that makes the unit all the more valuable. 10/21/2014 — Diana Leviton Gondek’s horse soon will ride again. The Naperville painter is among the local artists whose work comprises the Horses of Honor. The public art installation benefits the Chicago Police Memorial Foundation through creatively inspired tributes to officers who have died or become disabled in the line of duty since 1853. The exhibit includes about 60 life-sized horse statues, each painted to honor a specific officer. The horses will remain on display through the city’s Nov. 22 Festival of Lights before being sold via auction. The proceeds will benefit the foundation’s work in supporting loved ones left behind by the fallen officers. Leviton Gondek, 54, was stunned when she awakened Oct. 13 to learn her horse had fallen, just two days after it was put in place outside the Wrigley Building on the bustling Magnificent Mile. 10/16/2014 — The Horses of Honor project features unique contributions from artists in all corners of the state, but the Bridgeport area lays claim to the most. Abbey Salch, a project spokeswoman, said the pitch to use South Side artists came from friend and art broker Amy King, who recommended Sally Ko, an artist working from Bridgeport’s Zhou B Art Center. Another Zhou B artist, Injung Oh, soon followed. Accompanied by DJ music, Oh live-painted one of the horses at a recent “Third Friday” gallery event and invited the crowd to help out. 10/9/14 — Downtown Chicago is being inundated with not painted ponies but painted horses as part of the city’s newest public art display. 10/6/14 — Papyrus is thrilled to announce its support of The Chicago Police Memorial Foundation as a sponsor of a Horse of Honor on display in downtown Chicago through November. Created by the foundation, the Horses of Honor initiative pays tribute to more than 500 Chicago police officers who have fallen in the line of duty since 1853. Designed to resemble Chicago’s Mounted Patrol Unit horses, each statue decorated by sponsors and artists, serves as a public art display and will eventually be up for auction through both a live and online auction. All proceeds from sponsorships and auction items support the families of police officers who have been killed or severely injured on the job, including children’s college funds and rehabilitation and care costs for injured officers. Inspired by the unity and resilience of the Chicago community, the life-size Papyrus horse is a visual representation of hope and solidarity that often emerges after these tragedies. The deep blue lacquered horse features hundreds of butterflies ascending the statue’s frame, representing the support that city-wide initiatives like Horses of Honor provide to community members in need. “It is an honor to support such a great foundation and create a work of art that pays tribute to the city’s heroes,” says Sue Buchta, president of Papyrus-Recycled Greetings. Buchta noted that Papyrus—known for connecting people through greeting cards—was excited to further engage with the Chicago community through a new medium. 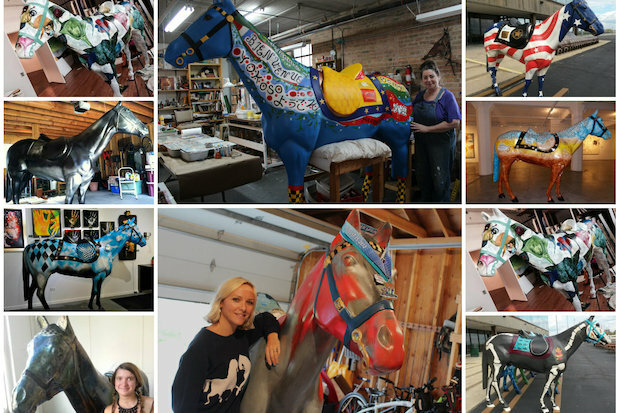 The horse will be on display through November on Chicago’s Magnificent Mile outside The Shops at North Bridge. The live auction is scheduled for December 3rd at the Hyatt Regency Chicago, and the online auction will begin the following day. To view pictures of the Papyrus horse, visit @Papyrusbrand on Facebook, Twitter and Instagram. 9/13/14 — A statue is dedicated to a Chicago Police officer who was killed in the line of duty. A “Horse of Honor” statue was unveiled in memory of Officer Michael Ceriale, who was killed in august of 1998. The statue was designed and painted by artist and fellow Chicago Police Officer Peter Bucks, who went to high school with Ceriale. “Horses of Honor” are statues of the city’s police horses and raise awareness and support for the Chicago Police Memorial Foundation.